Each week intensive has a different theme: one is held over the festival of Beltane (May Day) and the other over Samhain (Halloween /All Saints / All Souls). They start with an uplifting exploration of transformative breathing, chanting, mantra and sonic meditations, sacred chants, healing, shamanic ceremony and sonorous dream work. We learn and practice Mongolian overtone chanting, an ethereal and powerfully meditative vocal yoga which transforms our voices into rainbows of sound and light. We experience vocal purifications and ways to set parts of the body into resonance, cleanse and tune the chakras, and learn sonorous massage. A major part of these weeks is a living mandala ceremony. 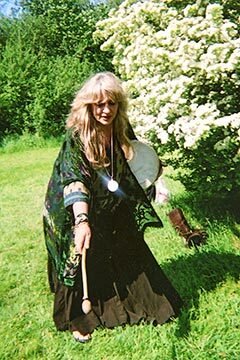 As the weeks are timed to coincide with the ancient celtic fire festivals of Beltane and Samhain, when the veils between the worlds are more permeable, we do a powerful ceremony to honour the ancestors and heal the ancestral lines, transforming family curses into their corresponding blessings. Working with the voice in this way empowers our lives, balances our mind and body and frees our voice, bringing physical health, emotional joy and spiritual ecstasy. Jill only does two of these Healing Voice weeklong retreats a year, and with limited places, they are in demand from people all over the world. Book early to secure your place! An introduction to the healing voice week intensive and mandala ceremony. March, 2019. 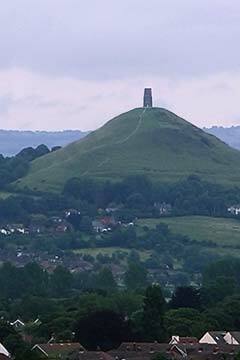 The Beltane (May Day) week is set in the heart of the beautiful Somerset countryside near Glastonbury (the mystical and ancient centre of Britain) in a breathtaking valley nestling between two sacred hills. 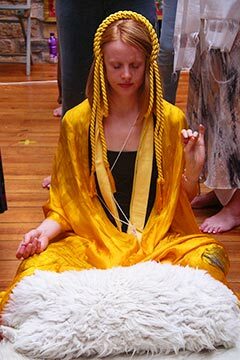 During the weekend we will learn and practice the ancient, shamanic and extraordinary Mongolian overtone chanting- an ethereal, magical and powerfully meditative vocal yoga; vocal purifications and transformative breathing practices; sacred chants, mantras, dream work, and a practice to heal the ancestral lines and transform family curses into their corresponding blessings. A glorious week of continuous singing and chant. Each week intensive has a different theme. In 2019 we will be journeying through MANDALA of GREEN TARA. 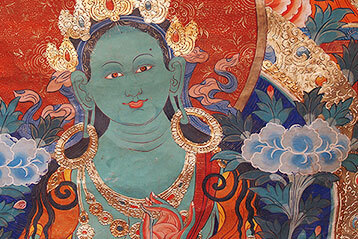 Jill's unique ceremony of the mandala will focus on the principal form of Tara. Green Tara acts fearlessly with lightening speed to activate our intentions and aspirations, fulfil our ambitions and answer our prayers. She enriches us with joy, and luminous wisdom, with radiance, richness of life and life's attributes, nourishment, happiness, inspiration, and eloquence. She helps us to thrive and allows our projects and relationships to flourish and our resources to flow. She increases our health, wealth, longevity and good fortune. She is a protector and powerful remover of obstacles, negative emotions, including fear, anxiety and depression. Green Tara is a fearless, all accomplishing, powerful, benign and generous intermediary, both individually and in the world. She shines her glorious radiant beneficence on us. The work we will do within this magical environment of continuous chants and practice will involve transforming those areas of our life where we feel unfulfilled, so that our deepest aspirations can be realised. Green Tara's gifts include enlightened achievement, karma-free, appropriate and fearless action; happiness and fulfilment; the immediate granting of wishes; luminous wisdom and ultimately enlightenment. This extraordinarily powerful week enables us to become effective in relation to who we are, our abundance, our relationships and how we fulfil our passion in the world. 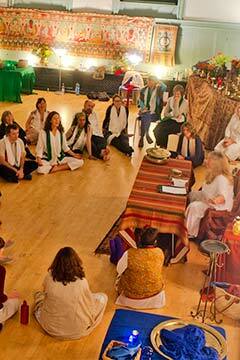 The practice enables us to heal ourselves and overcome obstructions to these aspirations. Journeying through the MANDALA OF GREEN TARA we experience the union of the sacred masculine and feminine, bliss and emptiness, beautiful continuous chants and practice. This mandala process, developed by Jill who has studied Dzogchen within the Tibetan tradition for over 40 years, includes a profound psychological healing process embedded in deep spiritual practice, which reveals the profound nature of the mandala in a unique way accessible to Western psychology and practice. Many people including almost all Tibetan Buddhists from the most sophisticated to the simplest, including the Dalai Lama, maintain their deep connection with the Great Goddess Tara, the feminine manifestation of the divine, known as the Mother of the Buddhas, and who acts swiftly and confers compassion, enlightened action, liberation, emotional and physical healing and long life, and is able to bring enlightenment in this lifetime. 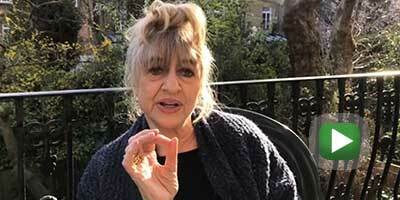 Through working with the extraordinary energies of Tara we are able to ease the blockages to achievements in work, in life and in emotional and physical health, bring about abundance, order and flow in our lives and work towards achieving the essential state of reality and become enlightened. 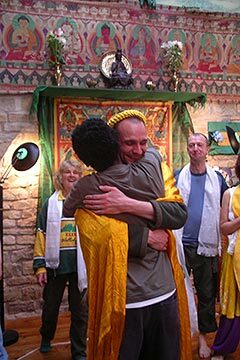 In Tibetan Buddhism, the ultimate liberation is to transform the elements of the body into the essence of their substance - the rainbow colours and ultimately achieve the rainbow body. 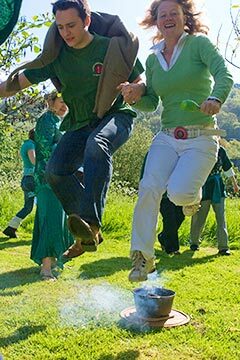 This week is held over the festival of Beltane or May Day (which we celebrate joyfully) , a festival of fecundity when the forces of heaven penetrate the earth (represented in traditional England by the Maypole). We will harness these forces using sound as the bridge between the worlds to connect to the source of power through the instrument of our own voice and purify the body, the elements and past karma. Jill only does one weeklong residential retreat of this kind a year so people come from all over the world. They fill early- so do book soon. Each week intensive is different. The 2019 Samhain (Halloween / All Saints / All Souls) week takes place in London, in Belsize Park, in a beautiful garden setting close to the 1000 acres of Hampstead Heath. £720 Non-residential. Inexpensive accommodation may be available for booking direct with the venue. As many people will stay there, early booking is essential for this. The aim of the October mandala ceremony, held as part of the week intensive over the festival of All Souls is to understand and learn the Tibetan practice of conscious dying, so we know how to become enlightened at the moment of transition. There are two principal practices for this, in 2018 we worked with the Phowa, and this Autumn within the mandala, we will practice the Zhitro, to understand the teachings and do the chants for journeying into enlightenment through the Bardo or intermediate state. In many traditions the intermediate realms are perceived as being sonorous, we will experience what this means and how to traverse them through chant. This part of the magical week involves continuous and diverse chant and practice, which Jill has activated at the heart of the mandala, described as the journey through the afterlife in the Tibetan Book of Living and Dying. This essential housework for mortals is a sophisticated practice at the core of the ancient Tibetan understanding of the mind. The practice for 2019 is a practice of extreme purification and identification of the states of the afterlife with our subtle bodies and the mantras for traversing this realm within us and in the afterlife. This mandala is the most powerful way of familiarising ourselves with the journey we will all take and enable us to work with our loved ones who are taking it before us. This is essential for all living beings, since it is a practice for enlightenment in this life too! We will understand how the journey towards enlightenment in this life is also the map of our post mortal journey. Both lead to a profound understanding of our psyche and our relationships with those nearest to us. 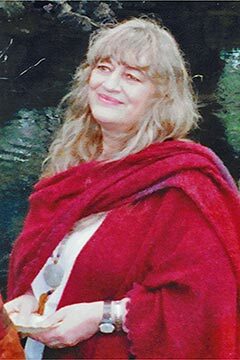 All Jill’s mandala ceremonies have a magical and sonorous period of working with our deepest, and hence unconscious, afflictive reactive emotions so we can see them in the light of illumination and transform them into their corresponding wisdoms. In this mandala we will work with the emotions provoked by people we are closest to, who trigger our deepest reactions. We will transform these unconscious reactions and turn our closest relationships into ones of daily delight, happiness and joy! This mandala process is the practice of the teaching of the Bardo, which is the encounter with these enlightened transformations of our unconscious delusions of mind. We learn how to recognise these luminous states and to distinguish them from the comforting phantasms which lure us back into realms of illusion, and finally recognise our projections and dissolve the sense of self into the light of reality. At this period of All Souls, and offered as an optional part of this retreat on one of the evenings, is a requiem mass held especially for us and for our ancestors at Jill's local church. During this service we will be able to sing and light candles for, and chant the names of our ancestors. In this way we bring together diverse and powerful ways of understanding and actively participating in this liminal moment in the year. As each of the themes of Jill's weeks are different - it may be some years before she does these two again - so if this work is important to you, try to make one or both of them. People come from all over the world to these retreats, and as places are limited they fill up fast.